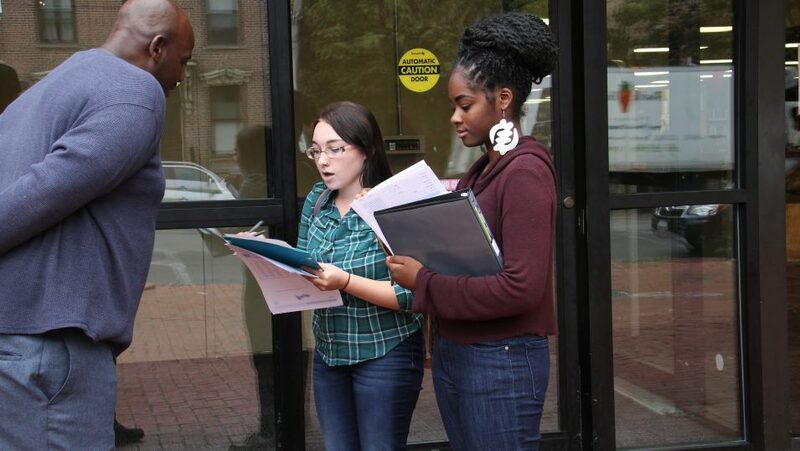 Saint Rose political science students Shayla Clark (center) and Destiny Knuckles knew what to say to convince Carlton McLeod to register to vote. On a recent Tuesday morning on Albany’s Washington Avenue, Saint Rose sophomore Marys Christie watched the foot traffic and had an insight about American democracy. 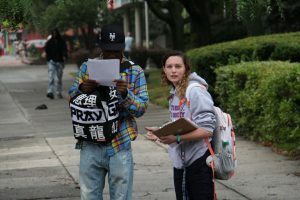 Across Washington Avenue, fellow students Jeffrey Vick and Kelsey Baldwin, who like Christie carried clipboards and forms, learned that Desiree DeCamp had never voted. They asked if she’d like to register; then helped her. Christie, Vick and Baldwin were among 50 Saint Rose political science students who fanned out in two parts of Albany last week to register voters and gain some insight about the attitudes and barriers surrounding one of the basic tenets of democracy. Professor Ryane Straus, who brought the students here, said their assignment was to determine whether we live in a true democracy, given the low rate of participation. In her class, students looked at socioeconomic data associated with turnout and discussed some of the confusing laws that might discourage voting. The League of Women Voters briefed them on how to approach and register people. Now, here along Washington Avenue and outside a supermarket on Central Avenue, the professor asked them to make their own observations about the lackluster participation. 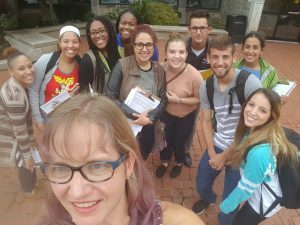 Fred Boehrer, director of the College’s Office of Academic Service-Learning, said the voter registration drive went well beyond community service. 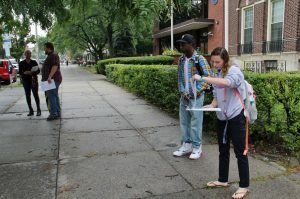 The exercise enabled Saint Rose students to connect their coursework about democracy to the larger world. Students said they found the experience rewarding, though some commented on how they felt slighted by people who ignored them. Some were struck by how many people said they were registered to vote – and they wondered how many actually voted. Some students found it easier than others to approach strangers. But by the end of the exercise they had collectively registered 69 voters in 20 counties and assisted 25 people who wished to vote by absentee ballot. At the supermarket, Boehrer saw a number of store employees register during a break – and one who had just finished his shift and made a point of approaching the students to do so. “There was a lot of good engagement,” Boehrer said. In front of the Albany Public Library, Carlton McLeod said he had thought he was not eligible to vote because he had been convicted of a felony. But freshman Destiny Knuckles and sophomore Shayla Clark let him know that in New York felons may vote once they have served their sentences. McLeod enthusiastically filled out registration forms. He said the students had made the difference.